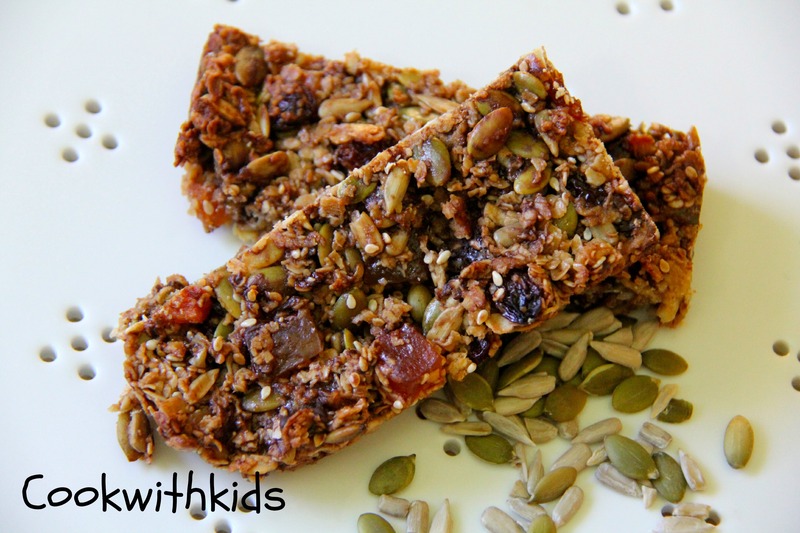 I have been looking for a yummy muesli bar type recipe for a while now. I came across this one on taste.com.au and it is delicious. It’s not super healthy but it’s not all bad. Full of yummy seeds, dried and fresh fruit and a little bit of chocolate it’s a winner! It’s also nut and egg free so great for lunch boxes. These are quite easy to make with kids although an adult needs to prepare the honey mixture on the stove, but other than that there’s lots of measuring, pouring and mixing. Thomas enjoyed tasting each of the types of seeds and talked about the different colours while we were cooking. He thought the dried fruit mix tasted like lollies! Maybe next time he asks for lollies I will give him some dried fruit ;-). Worth a try! They went down a treat for morning tea and Daddy took some in his lunch box today as well. Although it is difficult to stop at one! Consider yourself warned! 🙂 It is quite sweet so I don’t think leaving out the choc chips or reducing the measurement would be a problem if you wanted them a little less sweet. Preheat oven to 170°C/150°C fan-forced. Lightly grease a 3cm-deep, 17.5cm x 27cm (base) slice pan. Line with baking paper, allowing 2cm overhang at long ends. Combine sunflower seeds, pumpkin and chocolate chips in a large bowl. Place spread and honey in a saucepan over low heat. Cook, stirring occasionally, for 3 to 4 minutes or until melted. Bring to a simmer. Cook, stirring, for 3 minutes or until slightly thickened. Add spread mixture and apple to seed mixture. Stir to combine. Spoon into prepared pan. Using the back of a spoon, press mixture evenly into pan. Bake for 25 to 30 minutes or until golden. Cool in pan completely. Refrigerate for 2 hours. Cut into bars. Serve. My little man had his first day at preschool today. It was the first time we had ever left him with anyone other than us or Nanna so it was a big milestone in all our lives. Yesterday he was asking me for some of these biscuits and I had told him that I would make them for him while he was at preschool today. In all the emotion of this morning and saying goodbye, I had forgotten about it. Fortunately when I called preschool to see how Thomas was, they told me he had been telling them that I was going to make him biscuits while he was at preschool… Needless to say, after a little bit of an unsettled morning, he had a great day at preschool. Mummy on the other hand was in a little bit of a fog not having her little helper around. We did survive though! These biscuits are really yummy. Thomas and I made them to take to our neighbours place a couple of weeks ago and they didn’t even make it off the cooling rack they were eaten so quickly! They’re pretty quick and easy to make which is a bonus. The recipe is from taste.com.au. I really enjoyed baking these biscuits today. They were made with lots of love. It was quite therapeutic, not too taxing on the brain but enough to keep me busy for a little while. Thomas asked me as soon as I picked him up if I had made him biscuits… You’ve got to get your priorities right! I’m guessing I’ve set a precedent for afternoon tea after preschool… He has an amazing memory! Preheat oven to 180°C. Line a large, flat baking tray with baking paper. Using an electric mixer, cream butter, sugar and vanilla in a bowl until pale and creamy. Add flour. Mix on low speed until just combined. Add milk. Stir until dough comes together. Using a wooden spoon, stir in cornflakes and choc bits. Roll tablespoonfuls of mixture into balls. Place onto trays, allowing enough room for spreading. Flatten balls slightly with a spatula. 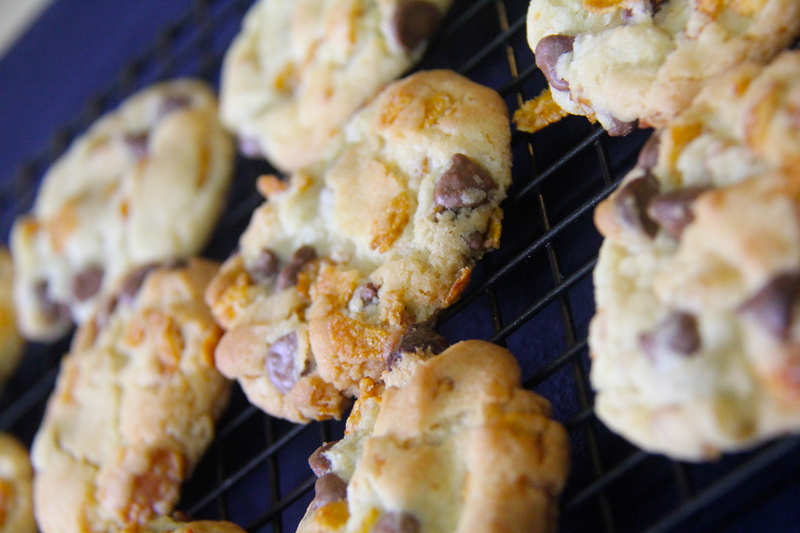 Bake cookies for 10 to 12 minutes or until light golden. Stand for 5 minutes. Transfer to a wire rack to cool completely. Repeat with remaining cookie mixture.